Following the craziness of the holidays and my birthday, we ventured to Key Largo, Florida for a little R&R. Overall it was a great trip - perfect weather, relaxing atmosphere and good food. In addition to the below, we had some wonderful ice cream at Mr. C's Gourmet Italian Ice Cream. The owner is a real character who has been making his own ice cream for years. We stayed at Rock Reef Resort, which was a charming small hotel on the bay side of Key Largo. Fish Matecumbe style at The Fish House. It was very tasty. Excellent key lime pie from The Fish House. View from the hotel. I went swimming in here despite it being a bit chilly. We enjoyed all of the hammocks around the property as well as the jacuzzi. Breakfast from Harriette's. The biscuit was not as good as we expected, but the omelet and pancakes were passable! Lazy conch at Chef Lupe's Mandalay Restaurant & Tiki Bar. This was really delicious - key lime butter finished it off. As an entree, we split this hogfish dish served with shrimp. Delicious! Another morning we ate at Mrs. Mac's Kitchen. They offer a champagne brunch option every day! One day we went to a bird rescue center. The funny thing was that birds that didn't need rescuing were trying to get into the rescue area! For the last few days of our trip we visited Coral Gables, where I couldn't resist sitting in the manger for a photo! On my actual birthday, December 23, Calvin surprised me with a sushi dinner at Nakato, followed by a performance of The Sound of Music at the Marcus Jewish Community Center of Atlanta. In addition to enjoying a wonderful show (and not being able to stop singing the songs!) it was neat to see this impressive facility. Overall this was one of my best birthdays ever. Thanks Calvin! Sashimi - white tuna, toro (fatty tuna), salmon and yellowtail. Scallop sushi and rainbow roll. Spicy salmon roll and unagi - very fresh and tasty. Green tea ice cream and green tea creme brulee - delicious! When we arrived home from the show, our friend Herb was there spending the night on the way to see his family in Mississippi. Herb was quickly a friend of Quincy. As the holidays approached we headed to Charlotte, my hometown, for some Hanukkah and birthday celebrations. We also attended a very neat Hindu wedding (see above post). It seemed like we were carried from one party to the next, celebrating with my dad's office, then a family Hanukkah party, then with my friend getting married and then for my birthday. Luckily my big day was not over yet! Sticky rice with mango birthday "cake" from Monsoon Thai Restaurant - this is one of my very favorite desserts! Calvin opening one of his presents as Grandma Sarah looks on. The real cake! My mom's yellow cake with chocolate frosting. I'm feeling pretty good as you can see! To begin celebrating my birthday I went out with several girl friends to Six Feet Under at their new location on Memorial Drive (only block or two east of their original location). The shrimp and grits were tasty, but my favorite item here is still the fish stew. The new setup is nice, with a huge bar area and more seating. We still waited about 20-30 minutes for a table for 5. For dessert we shared a key lime pie and a brownie sundae of some kind. We also tasted the Guinness Ice Cream, which was by far the most unique flavor I've had in awhile. I really liked it and I am not a big beer fan. I guess I need the cream to balance out the beery taste! Gifts from friends during our dinner at Six Feet Under. Our Holiday Office Party Feast. I made deviled eggs, lemon squares & butterscotch gingerbread cookies. I also helped put everything together! Gifts under the tree. Since I never had a tree growing up I relish the office party tree! Here's to a wonderful holiday season! For Thanksgiving we ventured to Celo, NC where I attended the wonderful Camp Celo as a child. 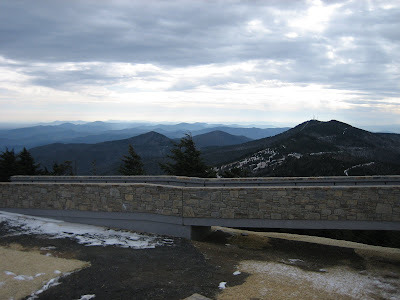 In addition to enjoying a great meal with friends for Turkey Day, we had a chance to sightsee in Asheville and climb atop Mt. Mitchell, the highest peak east of the Mississippi. Yum! 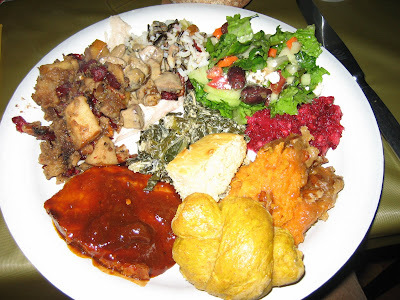 My Thanksgiving plate - trust me I needed a nap after this! Recently I tried Pupusas (thick, stuffed handmade tortillas found primarily in El Salvador) from two Atlanta locations: Rincon Latino and El Salvador Restaurant. Both were quite tasty. While the decor at Rincon is nothing to write home about, the blasting music at El Salvador may be too much for some people. I did like that El Salvador offered two styles of cabbage slaw for the pupusas - one spicy and one mild. Rincon provides patrons with cajeta (caramel) lollipops along with the check, which was a surprising treat. Unfortunately I didn't get any photos of the pupusas, but here is a look at the chips & salsa, condiment platter and spicy slaw at El Salvador Restaurant. Both restaurants serve Mexican dishes as well as Salvadoran specialties. One of my favorite brunch places is Highland Bakery, where we enjoyed a laid back Saturday brunch. Although the wait can be long here, we were seated in about 15 minutes. Since it's hard to decide between sweet and salty, I always enjoy sharing one of each with my dining companion. This time Calvin & I split the Burrito de Huevos, which were delicious, and the sweet potato pancakes, very sweet and also very delicious. The cinnamon rolls look enticing as do the lunch sandwiches. I will definitely be back here soon to sample more from the diverse menu. 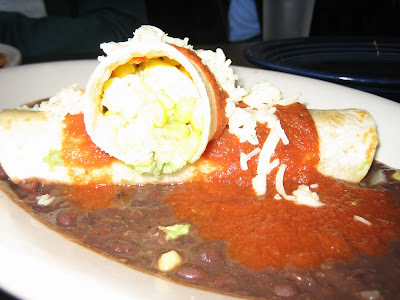 Burrito de Huevos with Avocado, served with black beans & spicy salsa. 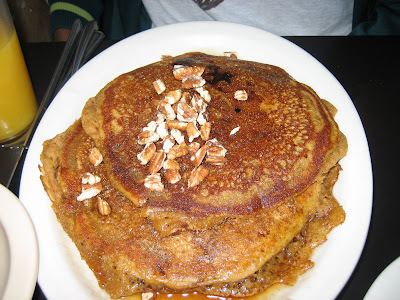 Sweet potato pancakes with brown sugar syrup. If you want some good barbecue, head to Daddy D'z on Memorial Drive. 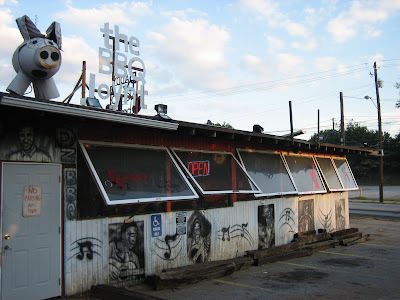 While the decor is nonexistent and the neighborhood is a wee bit sketchy, here you'll find succulent ribs, tasy mac 'n cheese and some of the best Brunswick stew around. The selection of cakes, which I found out are homemade for the restaurant, looked amazing, too. Alas, we were too full to try them. This is definitely a place I will return & would be a good place to bring out of towners for a real down home southern experience. The outside clues you in to the general ambience. 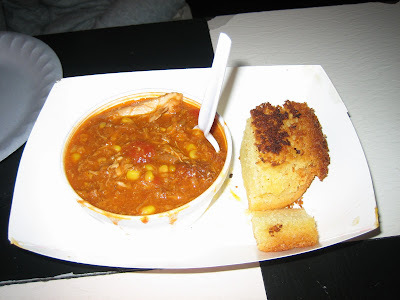 Thick, tomatoey, delicious Brunswick stew with cornbread. 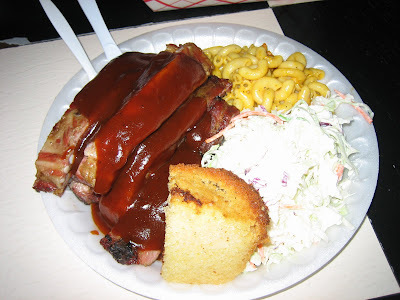 Rib platter with mac 'n cheese, slaw & corn bread. Unfortunately Calvin was not feeling well on his birthday so we had Cameli's (our favorite pizza joint) rather than going to the nice dinner I'd planned - we'll do it eventually! 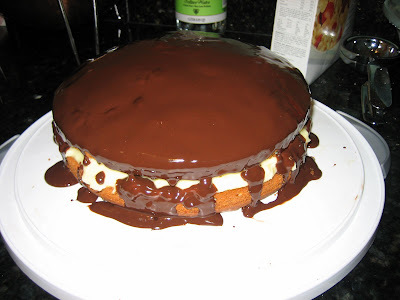 Later in the week I did make him a Boston Cream Pie, which was quite yummy if I do say so myself. After living in my new place for nearly 6 months, I decided it was time for a housewarming. 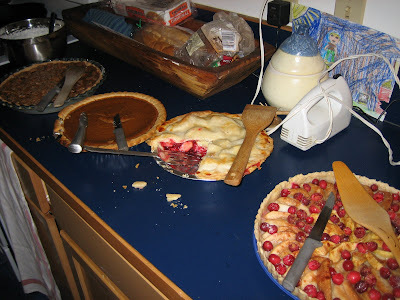 I made some food and invited lots of folks over to tour the house and have a bite to eat. 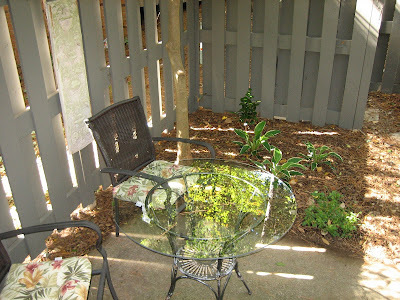 It was a lovely day so we were able to keep the windows open, which was nice, and guests enjoyed the back patio. 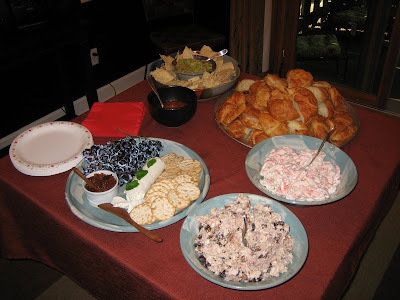 Cherry blue cheese chicken salad (homemade), shrimp salad (Costco - it's really good there! ), croissants, goat cheese with grapes, crackers and fig chutney, chips, guacamole and salsa. 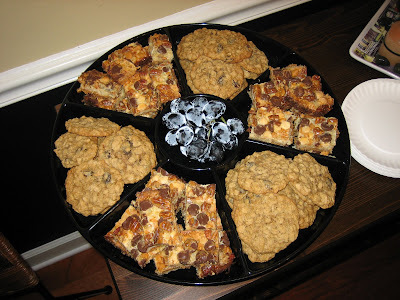 Oatmeal raisin cookies and magic cookie bars. 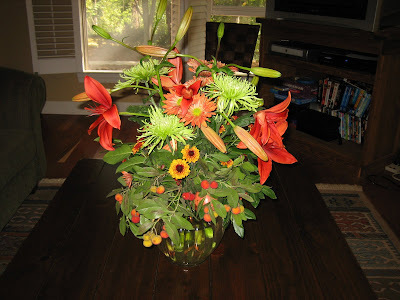 Ruth made me a beautiful flower arrangement. 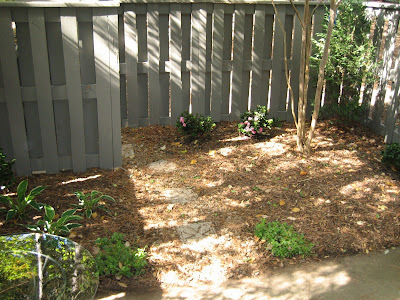 The back yard - hasn't ever looked this good, before or since! This fall after settling into my new place, I decided to take the plunge and purchase a Big Green Egg smoker & grill. So far, I've been able to get some good results, although I'm still getting the hang of regulating the temperature. So far I've cooked turkey burgers, beef burgers, lamb chops, swordfish & lots of vegetables. The key to these moist turkey burgers is Trader Joe's cranberry chutney as well as sauteed apples & onions that I mix in with the meat along with an egg, bread crumbs and spices. 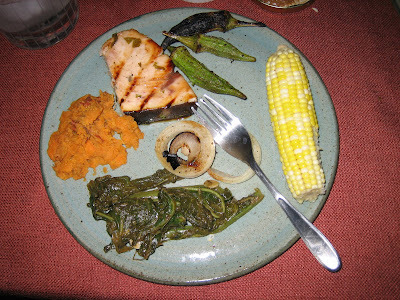 Grilled swordfish & grilled onions with mashed sweet potatoes, fresh corn & collard greens. 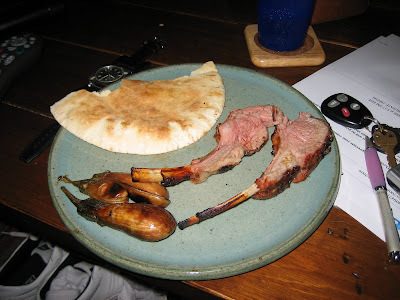 Grilled lamb chops, grilled baby eggplants & pita bread.